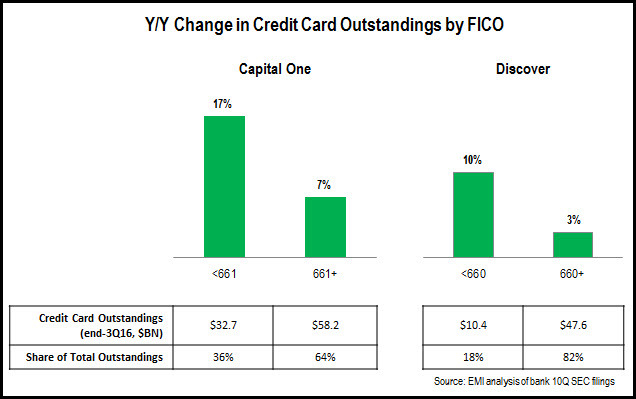 In a recent blog, EMI discussed some key takeaways from leading credit card issuers’ 3Q16 earnings, one of which was the relatively strong growth in credit card outstandings. In this blog, we look deeper into outstandings trends to identify what FICO Score segments issuers are focusing on to grow outstandings. Largest issuers: The following chart looks at y/y changes in outstandings by FICO Score for both Bank of America and Chase. (Citibank also published data on the FICO Score composition of its credit card outstandings, but these were skewed by the acquisition of the Costco portfolio from American Express, so we did not include Citibank in the analysis.) Bank of America generated low growth across most segments, as it struggles to grow overall outstandings following a protracted period of declines. Chase’s growth was concentrated in the 660+ FICO Score segment, boosted by the recent launches of both Sapphire Preferred and Freedom Unlimited. Monolines: Capital One and Discover both generated strong growth in the lower FICO Score (660 and under) segment. This segment now accounts for 36% of Capital One’s total credit card outstandings, significantly higher than Discover (18%) and Chase (14%). Wells Fargo: in spite of the fallout from the recent fake-account scandal, Wells Fargo continued to growth credit card outstandings in 3Q16. It reported strong growth across most FICO Score segments, with particularly strong growth in the subprime segment. However, it continues to struggle to grow superprime outstandings, as it lacks a card that can truly compete against high-profile affluent cards like American Express Gold and Platinum, and Chase Sapphire Preferred. Regional Bank Card Issuers: SunTrust, Regions and PNC all reported strong overall growth. SunTrust reported very strong growth across all segments. Regions’ outstandings growth was concentrated in the low-prime and subprime segments. However, PNC’s outstandings growth was concentrated in higher-FICO Score segments, driven by the April 2016 launch of the Premier Travelers Visa Signature® card. As issuers seek to continue to increase overall credit card loan growth, it is likely that they will continue to focus on multiple FICO Score segments. They will also be looking to identify underperforming segments, diagnose reasons for this underperformance (e.g., deficiencies in cards, offers or communications targeting these segments), and develop initiatives to improve performance. Similarly, issuers will want to identify if they are overly dependent on certain segments for outstandings growth or share, and whether this dependence leaves them vulnerable to changes in the macroeconomic or competitive environments. Numerous studies have highlighted deficiencies in financial literacy among U.S. consumers. FINRA Foundation’s National Financial Capability Study found that only 37% of people were considered to have high financial literacy in 2015, down from 42% in 2009 and 39% in 2012. Studies also show that consumer exposure to and engagement with financial education programs leads to smarter financial decision making. Therefore, the onus is on a range of entities (government, educational institutions, nonprofit organizations, industry associations, and of course financial firms) to develop programs to improve financial literacy. Many financial firms are looking to (re)position themselves as trusted providers of not just products and services, but also of information and advice that can help people better manage their finances. To that end, financial education programs can act as a means to help banks cement relationships with their clients. Conduct research to gain insights into consumers’ financial literacy levels, attitudes to financial services, preferred channels for consuming financial information, and favored sources of financial information and advice. Create a dedicated and branded financial literacy program that brings together the diverse range of financial education initiatives under one umbrella. These programs can take the form of an online portal, such as the TD Bank Learning Center, John Hancock Retirement Plan Services’ My Learning Center and MassMutual’s FutureSmart program. Conduct financial education surveys. Surveys are an effective way to raise consumer awareness and interest, highlight commitment to raising financial literacy, and gain insights that inform financial education program development and execution. U.S. Bank recently published two financial education surveys: the Parent Financial Education Survey (July 2016, focused on the parents of college students aged 18-14) and the Student and Personal Financial Survey (September 2016). Last month, Bank of America published the Bank of America/USA Today Better Money Habits report, which was versioned for 7 of its markets. Ensure that financial education content reflects the different ways that consumers process information. Keep content short, with easy-to-follow tips and soundbytes. Incorporate images, infographics or video to enhance its visual appeal. Distribute content through a range of channels. These channels can include online portals (as described above), events, in-person and online courses, and social media platforms. (PNC announced in August that it would be using Pinterest to promote its financial and early childhood education initiative.) In addition, a number of banks (e.g., First Tennessee, First National Bank and SunTrust) have partnered with Operation Hope to open HOPE Inside offices in its branches. SunTrust recently announced an ambitious plan to expand the Operation HOPE Inside program from 7 branches today to 200 by 2020. The number of individuals receiving financial counseling through these offices is expected to rise from 6,000 to 150,000. Partner with schools and nonprofit organizations that promote financial literacy in communities. This partnership can take the form of joint programs, funding or employee volunteer hours. Fifth Third recently introduced an initiative to deliver its Empower U financial literacy course through 60 local nonprofit organizations throughout its footprint. And Allianz Life recently awarded $275,000 in financial literacy grants to 14 nonprofit organizations in the Twin Cities. Well-constructed, well-delivered financial education programs improve financial literacy. This in turn leads to smarter financial decision making, benefitting both consumers and their financial providers.